Kyle Connor had a hat trick and one assist and Connor Hellebuyck made 33 saves as the Winnipeg Jets clinched a playoff spot with a 5-0 victory over the Nashville Predators on Saturday. Kyle Connor's new linemates were teasing the Winnipeg Jets forward about helping him score a third goal against the Nashville Predators on Saturday. Then they made it a reality. 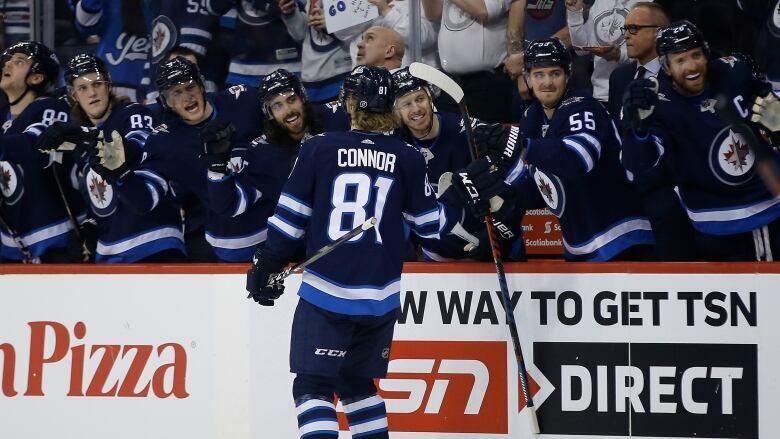 Connor recorded his first career hat trick with nine seconds remaining in the third period as the Jets clinched a playoff spot with a 5-0 victory over the Predators. He also added one assist. "That whole play starts with my linemates," Connor said of centre Kevin Hayes and right-winger Patrik Laine. "We were kind of joking, saying they were looking for me on that last shift and Patty made a great pass. I was just wide open there." Hayes had a goal and three assists, Andrew Copp also scored and Connor Hellebuyck made 33 saves for the Jets (45-26-4). It marked Hellebuyck's second shutout of the season and 14th of his career. Pekka Rinne stopped 38 shots for the Predators (42-28-6), who are in second place in the Central Division, four points back of the Jets. "Biggest game of the year up to this point and they're just better than us. It's disappointing," Nashville captain Roman Josi said. Winnipeg head coach Paul Maurice made some lineup changes for the game, slotting Nikolaj Ehlers on the left wing with centre Mark Scheifele and Blake Wheeler, and bumping Laine down to the right side of the second line with Hayes and Connor. "I liked all of them. I don't have a complaint about the effort of all the lines," Maurice said. Hellebuyck was impressed with what he saw in front of him. "They were phenomenal," he said. "They were getting their sticks on everything, they were blocking shots, they were controlling the pace of play." Wheeler said he noticed fans, who gave the team a standing ovation as the game clock wound down, ramped up the atmosphere inside Bell MTS Place from the first puck drop. The teams developed an intense rivalry last season, when the Jets defeated the Predators in Game 7 of the second round of the Stanley Cup playoffs. "I mean, that was a little bit different buzz than we've had in the building all year," Wheeler said. "Everyone was fired up for this one. We fed off that. I thought it was our best game of the year." The Jets were starting a four-game homestand and are 5-1-0 in their past six games. They won the season series with the Predators 3-1. Nashville was beginning a three-game road trip and is 3-2-1 in its past six games. "We lost five nothing," Predators head coach Peter Laviolette responded when asked to assess the game. "I thought the first period we played really well. I thought we had the edge and just with what we were trying to do I thought we were sharp and on point and then the next 40 [minutes] turned, we weren't good at all." Winnipeg mounted a 3-0 lead in the second. Nashville appeared to get the game's first goal three minutes into the second with a deflected shot by Calle Jarnkrok, but it was disallowed after review for Jarnkrok's high stick. "It didn't go in so there's nothing that you can do about it," Josi said. "That shouldn't turn the whole game. But after that, they were just all over us and scored a quick three and we couldn't react."